Snow Crash - Lexile® Find a Book | MetaMetrics Inc.
One of Time magazine's 100 all-time best English-language novels. Only once in a great while does a writer come along who defies comparisona writer so original he redefines the way we look at the world. Neal Stephenson is such a writer and Snow Crash is such a novel, weaving virtual reality, Sumerian myth, and just about everything in between with a cool, hip cybersensibility to bring us the gigathriller of the information age. In reality, Hiro Protagonist delivers pizza for Uncle Enzo's CosoNostra Pizza Inc., but in the Metaverse he's a warrior prince. Plunging headlong into the enigma of a new computer virus that's striking down hackers everywhere, he races along the neon-lit streets on a search-and-destroy mission for the shadowy virtual villain threatening to bring about infocalypse. 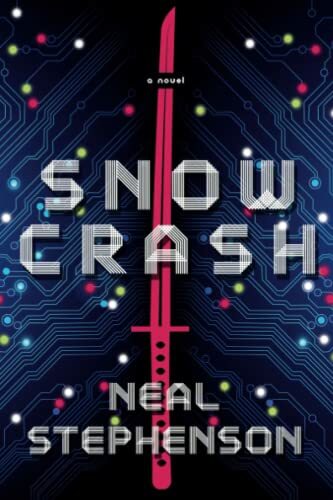 Snow Crash is a mind-altering romp through a future America so bizarre, so outrageous...you'll recognize it immediately.